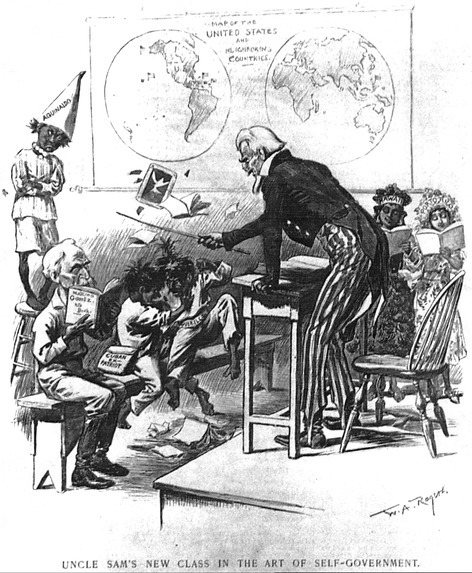 In this political cartoon from shortly after the conclusion of the Spanish-American War in 1898, "Uncle Sam" disciplines a class of unruly "children," representing Cuba, the Philippines, Puerto Rico, and Hawaii. The mustachioed figure reading the book at left is General Maximo Gomez, the military commander in Cuba's War of Independence, while the figure wearing the "dunce cap" represents Filipino independence leader Emilio Aguinaldo. While sarcastic touches, such as the "Map of the United States and Neighboring Countries" in the background, suggest the cartoonist may not have entirely approved of the United States' imperial efforts, his work nonetheless exemplifies the paternalistic and racist stereotypes with which Americans of all political stripes tended to view those in the countries that came under U.S. influence at the time. Source | W.A. Rogers, "Uncle Sam's New Class in Self-Government," Harper's Weekly, Vol. 42, No. 2175, 27 August 1898. Cite This document | W.A. Rogers, “Uncle Sam Teaches a Class In "Self-Government",” HERB: Resources for Teachers, accessed April 20, 2019, https://herb.ashp.cuny.edu/items/show/646.